Did you ever start a project with one idea in mind and end up with something totally different? I thought I'd make a nice 3D dragonfly out of modeling paste and then do a page around it. Welllllll, I bought a giant jar of Soho Modeling Paste from Jerry's Artarama. Super great deal! I have enough modeling paste to last me a few years now. The thing about modeling paste is that a little goes a long way. I had too much on my stencil and I ended up stenciling dragonflies in every darn art journal that I have going at the moment. I also used it with at least two other stencils. It was like it was growing. Then every time I use a stencil I had to wash it immediately. So I'm running back and forth from the kitchen to the studio. All the while I'm thinking... "run lots of water... I don't want my kitchen sink clogged with modeling paste. How would I explain THAT to a plumber?" After all that, I had to let all the dragonflies dry so now I can't even work in a journal because they all have wet modeling paste in them! Luckily, I was going to a Stampin Up party so I could get away from the wet paste mocking me. 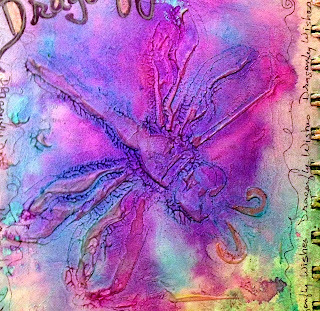 When I looked at my dragonfly that I'd stenciled on wax paper (image 1 above) he did not call me at all. He didn't say a single word about where he wanted to be on a page so I put him to the side. 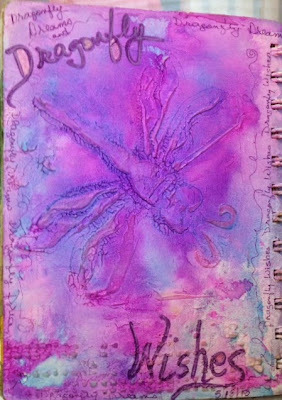 The dragonfly I did use was actually the last bits of the modeling paste slapped down with no thought in my Altered Cook Book. I loved him. He called to be sprayed with Ann's Homemade Salty Ocean Distressed Spray and Radiant Rain. I love how the color settled into the ridges. Part of me wants to remove the writing but I felt compelled to write Dragonfly Wishes so I've decided to leave it. A little doodling finished off the page. Notice... there is more modeling paste at the bottom of the page. That was done with a Crafter's Workshop stencil and the never ending modeling paste. Hahahaha - mocking paste! That is so funny. I can imagine you going back and forth at cartoon fast forward and the paste growing behind your back and doubling in size, haha. A great tale Boo! I'm laughing as well, can imagine how busy you were for a moment there. I love your end result though and I think it's a great way of doing it. Perhaps with some fewer next time. LOL.